While fans in Winnipeg lament that this young lad to the left isn't touring his homeland in Finland with the Jets, it might be for the best because current Manitoba Moose defenceman Sami Niku might have scored the goal of the year thus far, and we're not even out of October yet. Niku, who has a 2016 World Junior Championship gold medal and the 2018 AHL Eddie Shore Award for the top defenceman to his credit already, has been show all sorts of promise at the AHL level, leading most to believe that he should be playing up a level in the NHL. 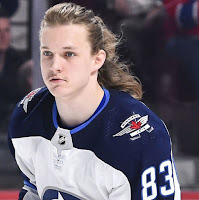 The Jets, for some reason, feel differently with the likes of Chiarot, Kulikov, and Morrow filling the gaps, but this allows fans of the Moose to really bask in the talent that is Sami Niku. If you missed the highlight-reel goal he scored, never fear because it was on virtually every highlight package tonight. With the Milwaukee Admirals in town to play the Moose on this Halloween eve, check out the juking and bobbing and weaving and head-faking that Niku does to score this goal. Holy moly, that is one heckuva goal! The call by Mitch Peacock on the video is solid, but Niku is as slippery as an eel covered in oil on that play, and the shot to finish the play is just as nice. Can someone tell me why he's not with the Jets in Finland? Or with the Jets at all? Granted, he probably wouldn't get that kind of room to manoeuvre in the NHL, but it's not like Niku hasn't made an impact there already. He scored a goal in his only NHL game thus far in his career and didn't look out of place that night. It might be time to unleash the beast and let Niku take a shot at filling the left side alongside Dustin Byfuglien. The kid's too good for the AHL, so let him run wild up in the NHL. yes, he'll make some mistakes - rookies always do - but he's a smart kid, he'll learn from those mistakes, and the Jets will be better off for it. What are you waiting for, Jets?